We had a very happy weekend here in January running a small retreat in our home. We spent time discussing health and lifestyle, especially detoxing, alkalising, and balancing nutrition. 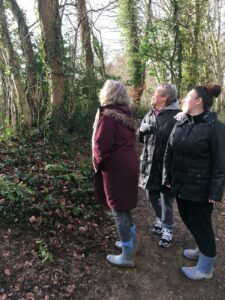 We enjoyed massage, meditation and visualisation, creativity, and a walk through our lovely local valley where the snowdrops were just appearing and the tree roots were fantastical. On the strength of this, and our delight in sharing all the information we have had access to, and to be able to work with others, we are now about to launch a new retreat into an expanded venue here where we live… so please look out for our deeply soothing, reviving and transformational Natural Beauty Retreat… coming soon!